TD/OMS Client Deployment for the non IBM i platforms extends the same deployment technology used to deploy to the IBM i, to platforms such as Windows, Linux and Unix systems. TD/OMS Client Deployment enables reliable and repeatable deployments with a standard base of templates that can be used to deploy to well-known applications such as Tomcat, WebSphere, and SQL database servers. 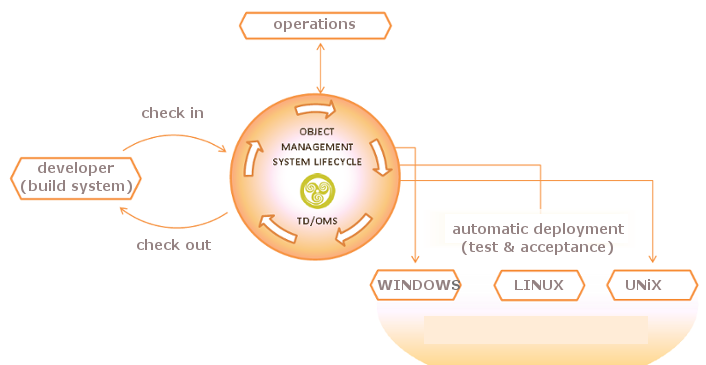 TD/OMS Client Deployment has an open architecture and allows you to easily extend the product to deployment scenarios of a more complex nature. TD/OMS Client Deployment provides real-time information on deployment, using the TD/OMS GUI you get instant feedback on the state of deployments and direct access to the transfer log of the running or completed deployment job.